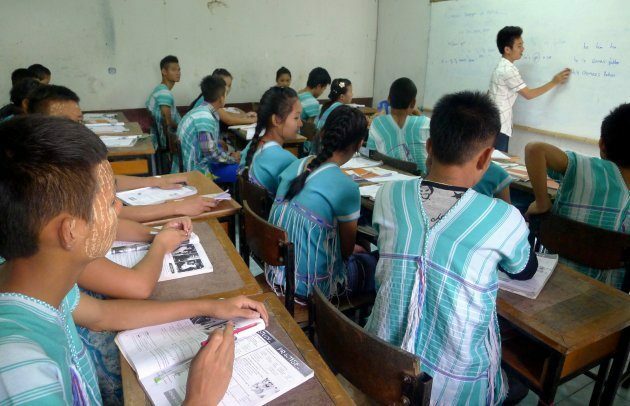 A recent crackdown by Thai authorities against illegal foreign workers has resulted in the temporary closure of several Burma migrant schools in Tak Province, according to the Burmese Migrant Teachers’ Association (BMTA). BMTA secretary U Naing Naing Tun told Karen News on June 29 that migrant school teachers have been spooked by the crackdown over the past week so are not coming to school. “Most of the teachers only have identification cards issued by the Thai Ministry of Education. The police can arrest them if they don’t have residency documents,” he said. It was not immediately clear how many of the 69 Myanmar migrant schools at the Thai-Myanmar border have been closed. The Thai police launched the crackdown on June 22 after a new foreign labour law concerning migrant workers in Thailand was enacted on June 20. Over 1,400 undocumented foreign workers – including over 1,000 Myanmar workers – have been arrested [as of June 29] so far, according to the Joint Action Committee for Burmese Affairs (JACBA)’s chairman U Moe Gyo. “They started the crackdown two days after it was enacted [so] the Thai government has shamelessly violated human rights [principles],” he claimed. Although the police have not made any arrests at migrant schools, they are arresting migrant workers on the streets and in markets, according to officials from the BMTA. BMTA officials said this also means that some undocumented Burma migrant parents are also not allowing their children to attend school.